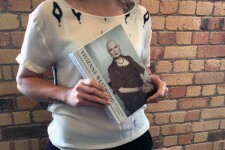 A little bit about the book to get fashion inspiration: For the first and only time, Vivienne Westwood has written a personal memoir, collaborating with award-winning biographer Ian Kelly, to describe the events, people and ideas that have shaped her extraordinary life. Told in all its glamour and glory, and with her unique voice, unexpected perspective and passionate honesty, this is her story full of fashion inspiration. the way that she changed her life onto a different path. She used unfortunate personal circumstances to her benefit – this is completely inspirational. Her hard attitude but soft compassion towards others inspires you to reconsider the way that you act and feel around other people. her current avant garde collections may not appeal to everyones sensibility… but there’s no doubt that her fashion is forward thinking and calculatedly thought out. music inspires: she worked with minimal resources to create fashion that is synonymous with the 70’s punk revolution. Want to try out a Vivienne Westwood inspired look? Punk: try out a slogan t-shirt (that’s also helping a good cause! ), or a dark sleeveless tee. Dramatic dresses: go all out with you next formal dress. The puffier the better! Cute slip on shoes: wear ballet shoes out and about. What did you think of the book? Did you find it informative? Let us know in the comments below. In " Book Club, Lifestyle"